As a teaching Pastor, you have a lot happening in your church and life. In a very small, similar way, I teach a large adult Bible Class each week. After preparing for my lesson, prayerfully considering what I should teach, and building my Keynote (like Powerpoint) presentation and rehearsing, I’m easily spending 6-7 hours a week. Then, I visit people in the hospital, attend socials, and occasionally funerals. I’m just a volunteer Bible teacher, so I can only imagine how difficult and time consuming it is running a church AND doing all of this for sermon prep. Authentically connect your church’s thread. Your thread is the ONE thing that your church should be known for so that your community will pay attention to you. How do you start? You ensure your congregation is reminded of it regularly. It must be an easy-to-remember-and-quote solution to a predominant concern that your neighbors are experiencing. 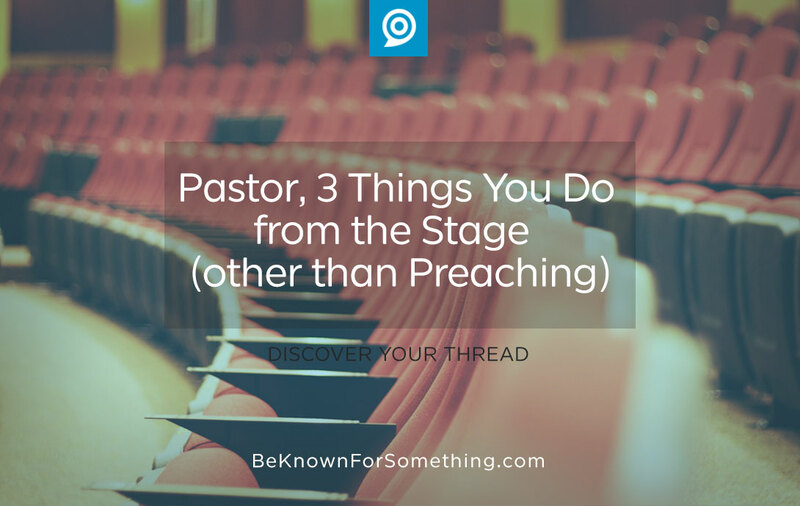 Once you know it (note: it’s not your vision), it’s up to you as the teaching Pastor to reinforce the thread through all of your series and sermons. Integrate some Tier One events into your conversation and sermon. The most difficult task of a busy church is to make the congregation aware of events. “Tier one” events are any ministry fellowship opportunity that welcomes 85% or more of your congregation. These may be known as “all church” events. You need to be actively reinforcing those announcements (although the church shouldn’t rely on you alone) so that your congregation knows you’re attending and supporting these events. Don’t necessarily promote other tier events (for less than 85% of the congregation) unless you can tie them to your thread. Reinforce your communication channels. I certainly hope you’re active on social media and possibly a regular blog. It IS the way the world connects to brands and people today. When you’re speaking to your congregation, you should continuously mention the church website, the church’s social media, your social media, your blog, your bulletin, and any other communication channel you want them to trust. Why should they trust it? Because you do. If you don’t, improve them or eliminate them. Your communication of Biblical truth to those attending your church is paramount. Period. But, in order to communicate the benefits of your church and engage an audience, these 3 things need to be communicated from the stage. Yes, by a host pastor, worship leader, or service emcee, but ALSO by you. Why? Because your mention is weighed much more heavily than others.